Up until now, when a combatant died in battle, he just vanished … that’s not pretty now, isn’t it? 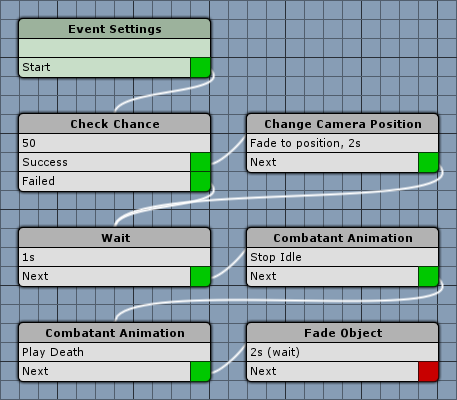 Luckily we can change that by using a Battle Event to animate death itself – let’s open the ORK Framework editor and navigate to Events. Click on New Battle Event to create the event. We’ll change the camera position in this event – this setting automatically resets the camera to where it was when the event started. This will automatically call Calculate for the action that is being performed at the end of the event (if it wasn’t called in the event) – so we don’t have to add a Calculate step ourself. We want to change a camera position in 50 % of the deaths. The chance check let’s us do this. We’ll connect this step with the Success slot of the Check Chance step. In a death action, the user and the target are both the dying combatant. Select Ease In Out Quad. We’ll connect this step with the Failed slot of the Check Chance step and the Next slot of the Change Camera Position step. In this step we’ll stop the Idle animation of the combatant – if we don’t do this (or stop all ongoing animations), the combatant might rise again after playing the Death animation. Now it’s time to play the Death animation. Finally, we’ll fade the combatant to a black color. Whatever the combatant’s current colors are – we’ll start from them. And that’s it for this event – click on Save Event and save it as death in Assets/Events/Battle/. The Defend command will let the combatant defend itself until his next turn – i.e. he will take less damage (how much is defined in Battle System > Battle Settings). To animate the Defend command, we use a battle event – so click on New Battle Event. In a defend action, the user and the target are both the defending combatant. Now it’s time to play the Defend animation. 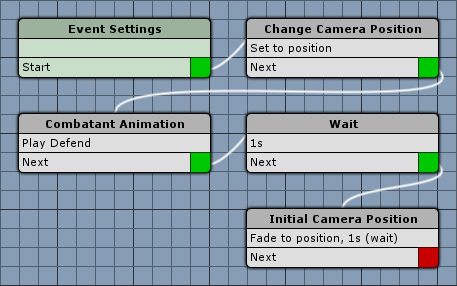 This step is used to set of fade the camera to it’s initial position (i.e. where it was at the start of the battle event). And that’s it for this event – click on Save Event and save it as defend in Assets/Events/Battle/. The Escape command let’s the combatant escape from the battle (by chance). We don’t have this command in our battle menu yet, but we’ll change that later. 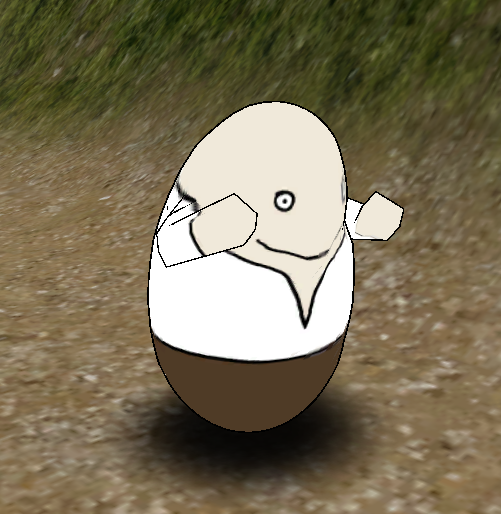 To animate the Escape command, we use a battle event – so click on New Battle Event. In an escape action, the user and the target are both the escaping combatant. Let’s turn the combatant around before running. We’ll connect this step to the Failed slot of the Check Chance step and to the Next slot of the Change Camera Position step. Set to X=0, Y=180, Z=0. Now it’s time to play the Run animation. That’s it for this event – click on Save Event and save it as escape in Assets/Events/Battle/. The battle events for our special actions are set up in Battle System > Battle Settings for all combatants, using the same way as we added battle events to items and abilities. Individual combatants can optionally override battle animations for these special actions, as well as for abilities and items. This can be done in the combatant’s Battle Settings > Override Settings > Battle Animations. Navigate to Battle System > Battle Settings change the following settings. Edit the already added Defend Battle Event 0. 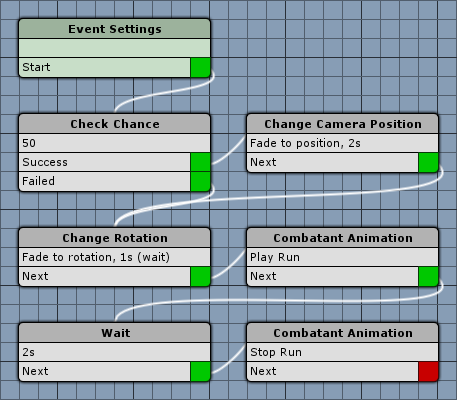 Enable Turn Based, Active Time, Real Time and Phase. Edit the already added Escape Battle Event 0. Edit the already added Death Battle Event 0. That’s it for battle animations. We can’t use the escape command yet, because we didn’t add it to the battle menu – let’s change this. Navigate to Battle System > Battle Menus and change the following settings in the Default Battle Menu. Click on Add Menu Item to add a new item to the menu. Open the main menu scene (0 Main Menu) and hit Play. Walk outside of the town and into the battle and use Defend and Escape – and watch your enemy die. Tip: If the battle is still to hard for you, you can also increase the player combatant’s start level. There’s still two things left for animating our battles – displaying the equipment and displaying the player’s status. And that’s it for now – the next lesson will cover displaying the equipment.